Like many Yamaha competition machines used stateside its origins are not purely oriental, in 1970 Yamaha approached American tuner and bike builder Sheldon Thuet to build a motorcycle capable of taking on the then dominant Harley Davidson V twins. Using a Trackmaster frame originally intended for a British twin cylinder engine the 650cc XS1 power plant was slotted in and a viable race bike was created. 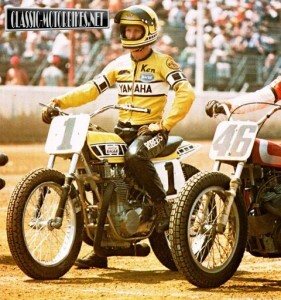 Chuck Palmgren riding a home built version of the XS flat track racer gave Yamaha their first win, in the process producing the first US National championship win by a Japanese bike in September 1970. For the 1972 season the Yamaha racers gained an increase in capacity to 750cc, complete with high compression piston providing a artio of 10.5:1 against the standard XS of 8.7:1, in an attempt at keeping them competitive against the ever faster and potentially easier to race Harleys and this extra power enabled Kenny Roberts to convincingly take the 73 and 74 championships. The exact history of Alastair’s bike is largely unknown, Alastair takes up the story “The bike is essentially as it left the track aside from a strip and clean up. It is unbelievably aggressive, sounds like the apocalypse and accelerates like a missile, completely belying its benign XS650 origins. What’s more it’s still set up for running on high octane racing fuel and produces a cone of flame from the exhausts like a jet fighter. It looks and sounds fantastic! Sadly, other than displaying it statically at various shows I haven’t been able to use it as much as I’ve planned. I have also recently increased the stable with the addition of a Trackmaster BSA A70 at the end of last year, which diverted my attention for a while, but my intention is to do events where I can run it rather than just static display, including sprinting it. Before the however I must fit another set of wheels for front brake and road tyres, the dirt track tyres are too soft for tarmac and would wear very quickly. I’ve also acquired an alloy tank for and runs because the additives in modern fuels can attack and melt the resins in the fibreglass tank. 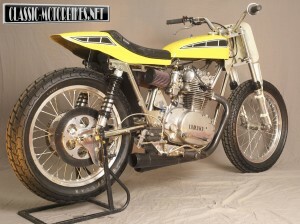 In more recent times the bike, then owned by successful classic dirt track racer Tom Horton was prepared for classic flat track racing by the intended rider Brian Coakley. The rebuild was completed in October ’96 with the motor to full race specification including Shell porting, pistons and cam. Later that month Brian won on the bike in its debut vintage race at Del Mar California, being radar gunned at 123mph on the mile dirt oval. Brian raced the bike in West Coast vintage flat track events up until late 2003. 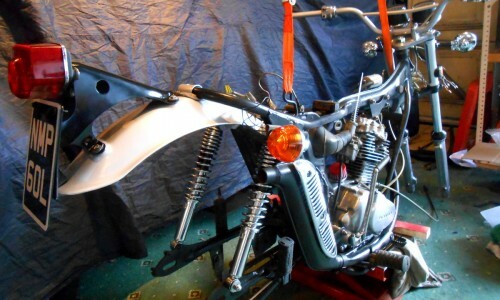 Alastair bought the race bike from him in the spring of 2004 and exported it to the Sutton Coldfield in the UK where it now lives alongside the XR750 Harley and the BSA.